Along with its sister ship the Bencomo Express, Bentago Express operates a frequent service to and from the capitals of Gran Canaria and Tenerife. Bentago Express has a passenger capacity of 859 and can carry 271 vehicles. 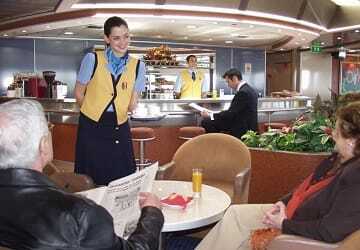 On board amenities include, bars, a boutique and a well-lit lounge. Please Note: Whilst we have taken great care in making our Bentago Express guide as accurate as possible, onboard facilities, services and entertainment may vary depending on the date and time of year that you travel, facilities mentioned may change without notification and ferry companies reserve the right to operate vessels other than those mentioned at time of booking without prior notification. We had a lovely day trip to Corralejo and would recommend anyone to take a similar trip. Very comfortable indeed. We had 2 good crossings between La Gomera and Los Christianos. The boat was clean and the staff were helpful. 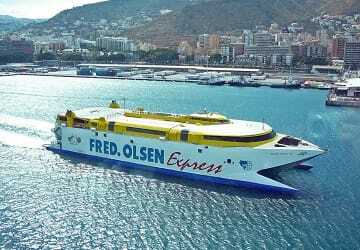 "Fred Olsen ferry Los Christianos to San Sebastion de la Gomera"
Booking through Direct Ferries was easy and straightforward. "Overtocht Santa Cruz naar Agaete"
De reis aan boord was geweldig. Het klantvriendelijkheid personeel zorgde goed voor ons etc ... Maar we hadden één groot probleem: wij konden de vertrekplaats in santa cruz niet vinden. Het heeft ongeveer 40 minuten geduurd voordat wij daar achterkwam. Negatief puntje is dat er totaal geen wegbewijzering is in de vertrekhaven. Dit kan zeker worden verbeterd. Gelukkig op tijd de boot gehaald, alwas het op het nippertje. Very little information about how to get to the port so i got lost. 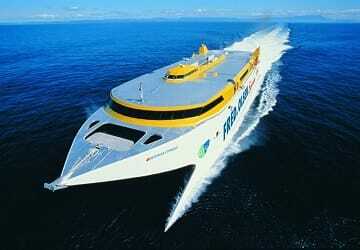 The port is far from Las Palmas and i wanted to travel on the first ferry of the morning but wasn't possible. Ship itself was ok.
"May visit to La Gomera"
Very good service, worth every penny, gives one a chance to visit the other islands in the canaries whilst on holiday, will be using this service again in October and there after. Book with confidence!! 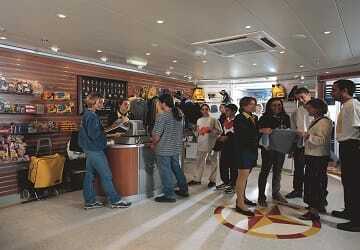 Everything went smoothly, the ferry was on time, the crossing was quick and confortable. The catering was reasonably priced. The only problem is that the staff organising the parking of the cars is Spanish speaking only. It's sometimes difficult to understand what they say. 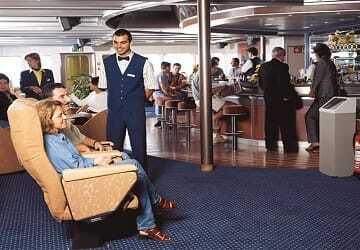 There are no outer decks, it's a shame, because we would have liked to enjoy the view. "Vacaciones en Fuerteventura y Lanzarote (18-25.4.14)"
Estoy feliz que visité la puerta de Las Palmas una semana antes, porque es posible que no hubiera podido encontrar la punta de salida de Fred Olsen en hora el dia 18. Soy peaton, y tenia que caminar 20 minutos desde la estación de guaguas de Santa Catalina. Una sugerencia: los carteles de Fred Olsen en las oficinas deberian ser más grandes, para que se puedan ver más facilmente de lejos. El viaje mismo (en ambas direcciónes) me encantó. Me parecia que el catamarán era de buena calidad y velocidad.